There are times – though they fall few and far between – when I hit on an idea so amazing that I think I might be a genius. I am making a mini-quiet book for our trip, and I am making it without any sewing. How am I doing this, you may ask? 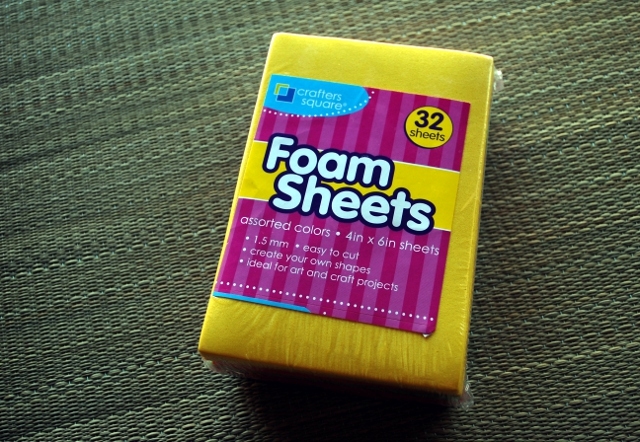 I am using foam sheets from the Dollar Tree and a glue gun. It’s going really well, too. I made five pages today. This immediately turned Elmo into the twins’ favorite page. 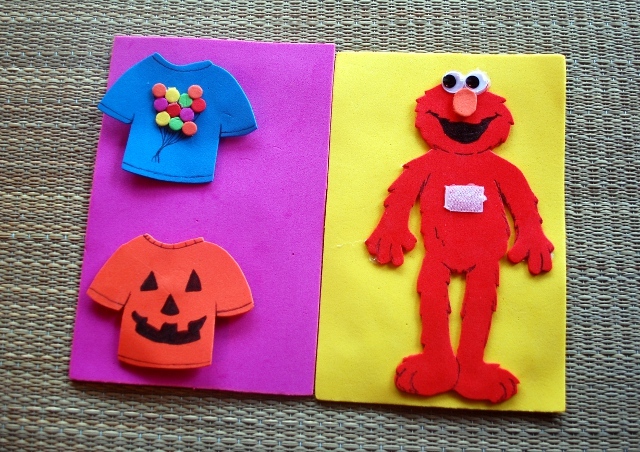 Much like in real life, they want to sit and change Elmo’s shirt over and over again. 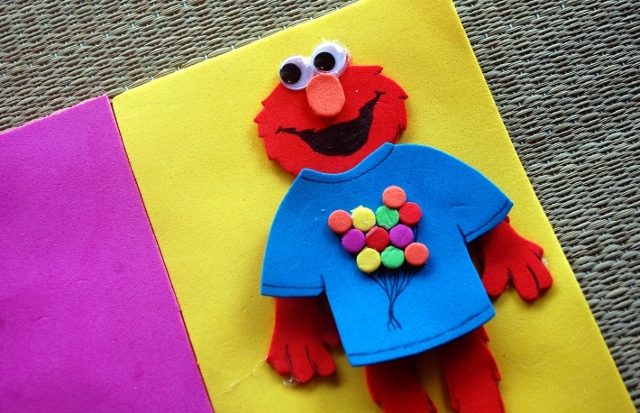 I might make a third one and keep it on Elmo, so they can rotate shirts instead of constantly switching back and forth. 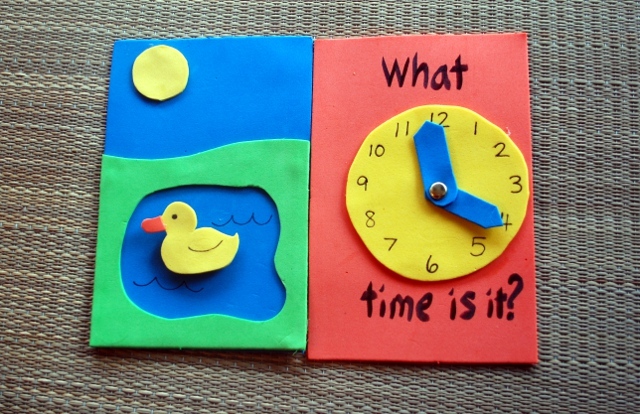 Next up we have a duck in a pond – there’s velcro on the back of the duck as well – and a clock. Foam sheets are kind of like a cross between paper and felt, so it was easy to poke a brad (brass paper fastener? Does anyone else call them brads?) through to make a clock that goes around. Finally, there’s one single page. Cookie monster!!! With cookies, of course. Cookie has velcro in his mouth and by his hand so you can feed him or give him one of the cookies floating above his head. This page is also extremely popular with the twins. 1. I’m planning on binding them by punching three holes in one side and tying yarn through. Be sure to leave at least half an inch on the side you’re going to punch holes in to leave room. 2. Be sure to make the same number of right pages and left pages. 3. Even though you could glue things to both the front and back of the sheet, I recommend using only one side and gluing the back to the back of another sheet for added stability. 4. A word about velcro: be sure you glue your velcro down ALL the way to the edges, or it will peel off with use. Also, only use small pieces of velcro, the quiet book pieces are light. You don’t want enough grip to pull the glue right off! One more thing: when adding velcro that won’t be holding its match at all times…make sure you use the right side. 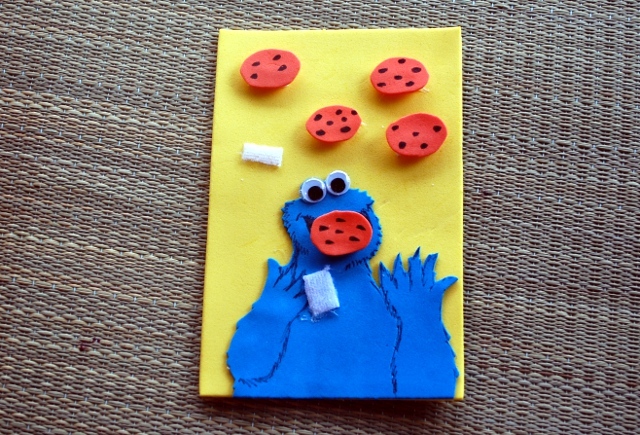 You’d hate to finish a page and find out that, say, Cookie Monster can’t eat his cookies because the velcro in his mouth is the same kind as the velcro on the cookies. Not that that happened to me. It’s so fun! I can’t wait to make some more pages! This entry was posted in How To, In Progress, Other Projects. Have the twins ever seen a real clock with hands that point? Sure! We have one on our wall! Very cute! Your Elmo and Cookie rock!